Love escape rooms but looking for one with a difference? Then this one is not to be missed before it vanishes from The Vaults in where it is situated at present. Escapemobile offers a new and exciting twist on the escape game format. Teams of up to 5 players can play and be locked up within the van and you will have just 20 minutes to escape. ‘Houdini’s Last Trick’ pits audiences to the task of escaping from a challenge designed by the Great Houdini himself. They must escape handcuffs, chains and straightjackets by solving a variety of magic and illusion themed puzzles; from finding a secret message hidden in playing cards to cracking the combination to a locked trunk. 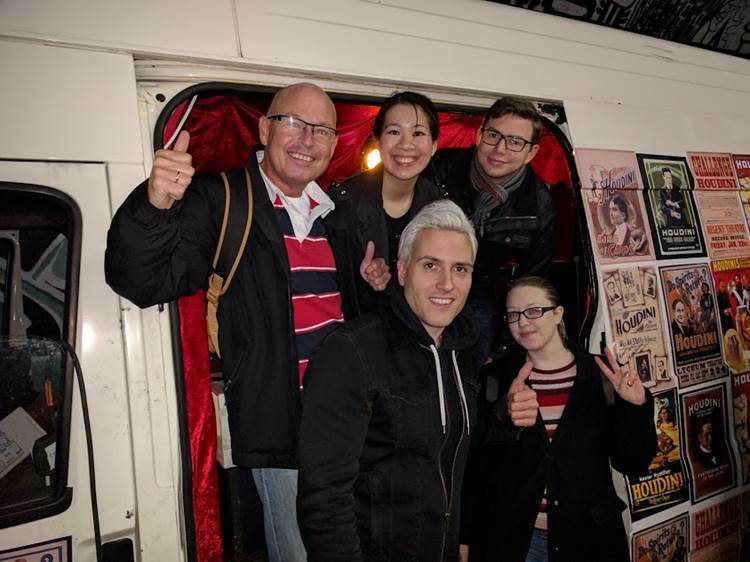 Thanks to Escapemobile who let the community of Love Pop Ups London come down to experience their unique escape room concept. Read all blogs/reviews from the members from the comments section below. The Vaults is a great venue. I love coming here!! What a great Escape Room concept we enjoyed at the Vaults Festival. There were five of us locked up in the back of the dormobile van. We were handcuffed together and had 30 minutes to get a key from one end of the van to the other to enable us to open the door and escape . The whole theme is based around the magic and escapes of Houdini. The van is fitted out in Victorian style with every object key to solving the clue to escape. I won’t say any more about the puzzles or how to solve them as this would spoil the event for any future escapees. All five of us had a great time, and enjoyed it very much. For £9 it is great value! If you like escape rooms you will not be disappointed! Also the venue of the Vault has great bars and chill out areas you can enjoy either before, after or both. This has got to be one of the most fun escape experiences I’ve had. I would highly recommend it. Book soon though as it is only here until March!! Did my first ever escape-mobile tonight and manages to get our despite being handcuffed and only having 25 minutes to make it through. We were a good team though and the puzzles we very clever and had us constantly thinking while we never got frustrated. We did get one or two clues from the ghost of Houdini (naturally as it’s themed after his escapes) which helped out when we got off track. Overall, considering the small space, the escape-mobile was well designed and very fun. It’s around for the vaults festival until the 5th of March, so check it out with your friends. Well what can I say? A temporary pop up van that delivers the same great mystery, adrenaline ridden experience as countless other stationary escape rooms that seem to crop up all over London. It’s not good practise for one to step into a white transit van voluntarily but I’d like to be the first to say that this was my version of a Scooby Doo mystery van. Without revealing more about the actual game, its important to keep your wits about you and to think of the obvious wink emoticon;-) It’s cleverly laid out and although 25 minutes seem a short amount of time, it is just about enough to find the key to unlock the van door to your freedom! Located in the heart of the graffiti’d tunnels just right outside The Vaults, this little creation is defo one to try before it drives off into the sunset. Handcuffed to a stranger, thrown in to the back of a van and locked in with only 25 minutes on the clock to escape isn’t how I would usually spend my Wednesday nights but this week I made an exception. You see I’d been invited along to check out Escapemobile – the very first mobile escape room – and I couldn’t very well turn it down, could I?